According to a telegram received today from Coudenhove the Siamese minister for foreign affairs had declared that all measures had been taken to receive me in the best manner possible but at the moment there existed no certainty in Siam about the further development of the current complications. Therefore I decided with a heavy heart to take the higher diplomatic considerations into account and forgo the chance to gain in a stay, even if only a brief one, some insight about the state of the kingdom of Siam — a state it would have been of the highest interest to learn more about even if only furtively. The homeland of a thousand year old civilization combining autochthonous elements with Indian and Chinese forms, Siam is the sole still independent kingdom of the South East Asian peninsula that has managed to preserve the character of oriental autocracy in pure form. The territory of the „lord of the white elephants“ had managed to stay out of the spheres of influence of the European states up to now and be open to European influence only as far as that was achievable without harming the national peculiarities. The visit to the royal court of Siam, seeing the strange luxurious architecture that Bangkok offers in its temples and palace rooms as „Asia’s Venice“, observing Siamese culture, art and customs as well as hunting in the hilly woods and swamps of the country that will certainly be rewarding for my eagerly growing collections — all this and a number of beautiful, educational and hunting days became the victim of international entanglements. My tropical fever hindered me also today to go on land. While at the beginning I was forced to stay in bed which was extremely uncomfortable due to the terrible heat in the cabins, I managed now to rest on a chaise longue on the afterdeck castle or on the iron deck and thus enjoy the refreshing air cool the high temperature. The recovery from tropical fever and the abatement of the weakness connected to it is retarded by two factors as long as the ill person is on board of a ship: The first factor is the suffering caused by the heat for which there are fewer countermeasures available on board than on land. Secondly, it is difficult to prepare the necessary invigorating food on board. The tropical fever leads to a complete bodily weakness, despite the best care and food, so that the level of activity of an ill person is similar to that of a housefly in autumn. While the physical condition of an ill person amounts to a total weakness of all the body’s forces, the psychic condition is such that there are frequent changes from total passivity to keyed up nervousness. The resulting depressive spirit will cause, after intervals of absolute passivity, a mood in the ill person that makes interacting with him nothing less than interesting for persons in proximity. My gentlemen had done some shopping for me in the city and among else restocked the menagerie as death had recently produced quite a few important empty spots. A part of our animals also was set to be sent home on board of the just departing (Austrian) Lloyd’s steamboat „Vindobona“. As a replacement I had bought 14 monkeys which climbed up the yards and shrouds or outboards into the battery. Two of these four limbed animals just used the first moment of their golden liberty to enter the cabins of the first lieutenant and the chief engineer and produce such a chaos there that it looked in there like the aftermath of a heavy storm. One of the wrongdoers was caught when it, having completed the work of destruction, admired itself self-satisfied in the mirror after using plenty of the toiletteries laying around. When the sun set, I had already lost the last hope to visit Bangkok and buried it in the endless sea. 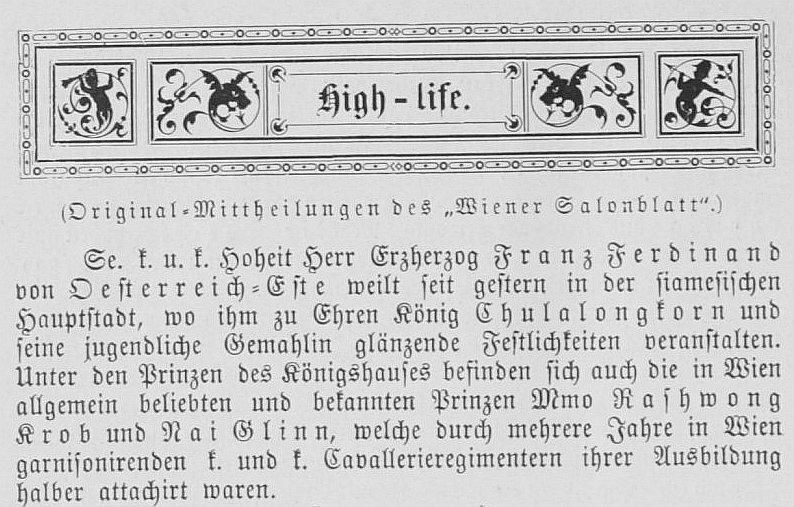 ANNO – on 15.07.1893 in Austria’s newspapers. The k.u.k. Hof-Burgtheater is playing „Hamlet“. The k.u.k. Hof-Operntheater is closed from 1 June to 19 July. Not content with misinforming its readers about FF’s stay in Siam, the Salonblatt adds an imaginative but wrong impression of the meeting. Dieser Beitrag wurde am 15. July 2018 von wordpressadmin in diary veröffentlicht. Schlagworte: July, rest, Singapore.